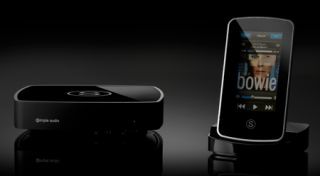 Simple Audio rolls out Roomplayer HD audio system to UK dealers | What Hi-Fi? It's been a long time coming, but Simple Audio's high-resolution, multiroom music system has finally landed at UK retailers "for preview" and goes on sale later this month. It was initially due to launch last December. The system uses HomePlug Powerline and wired ethernet technology to transmit 24-bit, HD sound via your home's mains electricity network to different rooms, rather than relying on wireless transmission as used by the likes of AirPlay and Sonos. This is said to give a more robust connection between different zones, and allow the transmission of 24-bit audio files. A full-colour touchscreen controller allows you to browse your music library and create your own playlists. Simple Audio is offering two products. The Roomplayer 1 (£599), with 2x50W built-in Class D digital amplifier, connects directly to your speakers. If you already have an existing hi-fi or home cinema system, you can add the Roomplayer II (£499) which does without built-in amplification. The user then downloads the Simple Audio software to a computer, hooks the computer and Roomplayer up to a HomePlug network via ethernet and then streams music from the Mac/PC to the Roomplayer. The system will handle MP3, AAC, WAV, AIFF, FLAC and Apple Lossless files, as well as internet radio. Line input/output phono sockets, a front-mounted line in socket, USB terminal, optical and electrical digital outputs, subwoofer out and headphone socket are all included. As well as playing back music from your iTunes library and internet music services, it will also handle music from attached devices such as an iPod or iPhone. Simple Audio was founded by ex-Linn employees. You'll be able to see the Simple Audio Roomplayer system in action at this month's Bristol Sound & Vision Show.